What’s New at Panel Built, Inc.? Panel Types! Non-Combustible Sound Panels. Panel Built, Inc. is proud to announce the addition of three new panel types to our product mix. All three panels serve a need requested by our customers regarding two common specifications; sound and fire. The first panel is focused on sound, providing a higher STC than our standard Value Line panels, but utilizing the same modular building system. 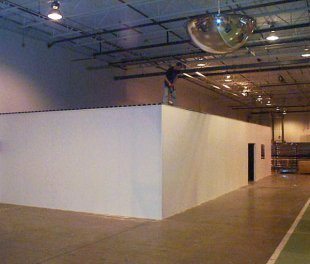 Composed of gypsum, sound board, and poly-styrene; these panels are ideal for noisy warehouses or back-to-back offices where sound transference is an issue. Panel Built, Inc. calls these panels Standard Sound Panels, and they are available in three standard colors, as well as custom colors and finishes by request. The second panel type is a low-cost non-combustible panel designed to work in the same modular building system as our Value Line panels. These panels utilize a poly-isocyanurate core laminated with vinyl faced gypsum on either side. Poly-Iso is an FM approved non-combustible material which provides a higher R-value than poly-styrene at a relatively minimal price increase. 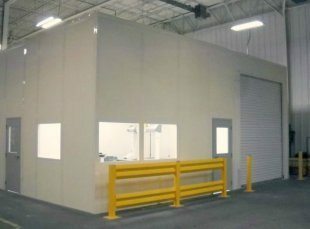 Available in three standard colors, these panels are ideal for machine shops and manufacturing facilities where insurance requirements necessitate non-combustible construction. Before deciding on traditional construction, compare it to our Standard Non-Combustible panel building system which achieves the same fire rating at a fraction of the cost and time. The final panel type introduced today is our Non-Combustible Sound Panel. As the name implies, this panel takes into account both sound and fire specifications and provides a high STC panel with a non-combustible core. These panels feature a pre-formed metal stud sub-frame with mineral wool core laminated to vinyl faced gypsum on either side. Also designed to work with our existing modular building system, these panels are available up to 12 feet tall. As always, Panel Built’s experienced modular building experts will help you find the best solution for your specific needs. It is always a good idea to check with your insurance company to discover their fire rating requirements for modular construction before purchasing. For those instances where a 1-hour fire rating is required, Panel Built also offers a certified 1-hour system. system.